If you happen to get a better offer, we'll beat it, offer it or give you $500. At Capital Direct we guarantee that you'll get the best rate on your mortgage from us. If you've done your research, you'll recognize immediately why we are confident in our rates. 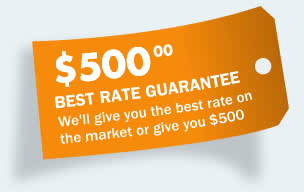 If you happen to get offered a better rate else where, we'll beat it, offer it or give you $500. It's that simple! Apply online or contact a Capital Direct mortgage specialist at 1-800-625-7747. Lock-in the best mortgage loan rate. If you get offered a lower rate within 7 days on mortgage with equivalent provisions from any mortgage broker or lender in Canada, let us know and we'll beat it, offer it or give you $500 when you complete the competitor's mortgage. To qualify, deliver to Capital Direct a copy of the registered mortgage document. The documents must be accurate, and disclose that the loan closed on the terms and conditions, including the fixed rate as previously disclosed, in the mortgage commitment. We'll try to beat or offer the rate, but If Capital Direct is unable to provide you with the lower fixed rate mortgage and you complete the mortgage financing with the competing lender on the quoted terms, Capital Direct will pay you $500. Lock-in the best equity loan rate available for your property. Your equity loan gets funded. If within 7 days of funding, you find a lower fixed rate mortgage with equivalent provisions, let us know. To qualify, deliver to Capital Direct a copy of the competitors mortgage commitment granting a lower rate on a mortgage with equivalent provisions. The competitor's commitment must be dated and delivered to Capital Direct within 7 days of the date your mortgage was funded. If the stated mortgage rate is lower than your Capital Direct mortgage, then we will pay you $500.00.